...that the Warrior-Servants were a rate of Forerunners specializing in the conduct of warfare? ...that Luna, Earth's moon, has been colonized? ...that Covenant starships are powered with pinch fusion reactors? ...that Microsoft named the first of their Project Natick computers after a character from i love bees? "Id Quot Circumiret, Circumveniat (What goes around, comes around.)" 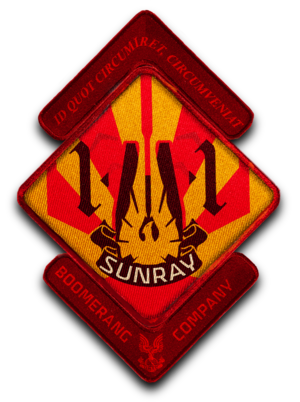 Sunray 1-1 is a small team of UNSC Marine Orbital Drop Shock Troopers, and the lead element of Boomerang Company, one of the UNSC’s elite forces of Orbital Drop Shock Troopers, under the command of Major Vaughan, assigned to the UNSC Spirit of Fire. Major Vaughan - Team Leader, CO of Boomerang Company. Warrant Officer Quinn - Technical Liaison. Petty Officer Gruss - Medic. Corporal Turpin - Drone Operator. Lance Corporal Sparks - Designated Marksman. Sunray 1-1 was present on the modified Phoenix-class colony ship on February 4, 2531 when it arrived at the Outer Colony of Harvest to fight the Covenant's Fleet of Glorious Interdiction there. The squad then went on to witness the Battle for Arcadia and the fight between the UNSC crew and the Fleet of Glorious Interdiction within the Forerunner shield world known as the Etran Harborage. After the ship's Shaw-Fujikawa translight engine was sacrificed to destroy the shield world, the members of Sunray 1-1 entered cryostasis along with the rest of the crew. Over twenty-eight years later on March 28, 2559, Sunray 1-1 and everyone else were awakened to find themselves drifting above the extragalactic Installation 00, also known as the Ark. There, the vessel's forces were forced to contend with the Banished, a heavily-armed faction of ex-Covenant that sought to control the Ark largely due to its capacity for producing Halo superweapons. After the departure of a newly-created Halo ring put it beyond the Banished's grasp on April 2, 2559, the Mgalekgolo pair known as Colony hatched a plot which James Cutter, captain of the Spirit of Fire, had no choice but to respond to. Sunray 1-1 were tasked with stopping Colony's scheme as part of Operation: SPEARBREAKER. Upon returning from their successful mission, Sunray wasted no time in moving on to meet additional challenges. Deployed into some of the most hostile, Banished-occupied areas of Installation 00, Sunray has encountered hostile resistance from Warlords, Sentinels, and Forerunner armiger contingents alike. Sunray's most recent missions involve the elimination of Banished commanders identified by Isabel as being critical to Atriox's attempts to harness the Ark's power. Shortly after SPEARBREAKER, Major Vaughan led Sunray on a successful clandestine assassination of a Jiralhanae captain. Employing tactics gleaned from archived after-action reports from Operation: GREY VEIL on Heian, Lance Corporal Sparks landed a killshot that has quickly become legend amongst other marksmen aboard the Spirit of Fire. Sunray 1-1 descending from orbit. Sunray 1-1 after landing on Installation 00. ↑ Halo Wars 2, Phoenix Logs – "Alice-130 Report #1"